In 1888, in Leeds, the French inventor Louis Le Prince shot what many now consider to be the world’s first films. Fragments of three survive – the Roundhay Garden, Accordion and Leeds Bridge scenes – in which the inventor managed to capture moving pictures years before Thomas Edison or the Lumière brothers. Le Prince, however, never got to show the world beyond his workshop what he had achieved. On 16 September 1890, just before he was due to demonstrate his films in public for the first time, he boarded the Dijon to Paris train and was never seen again. Louis Aimeé Augustin Le Prince, a young artist, engineer and photographer, came to Leeds in 1866, where he worked in a brass foundry, married, started a family and involved himself in the social and intellectual circles of the city. In 1888, he built a single lens camera with which he shot a number of films. Where the tram horses were seen moving over it and all the other traffic as if you was on the bridge yourself. I could even see the smoke coming out of a man’s pipe, who was lounging on the bridge. Yet, in the fleeting remains of the Leeds Bridge Scene, no one can be seen smoking. And despite the presence of horse-drawn carts, actual tram horses and trams are absent. But it is the technical clues which suggest most strongly that the specific images we now associate with Le Prince’s stuttering and secretive projection of films in Leeds are not those he showed his workshop audience, but instead are what he had left on the ‘cutting room’ floor: Le Prince, working before celluloid became readily available, used rolls of sensitised paper in his camera. Using such a material in a projector, however, proved infeasible as it would cockle and burn in the heat of the lights. Le Prince therefore used a specific form of sensitised paper, which allowed him to peel off the exposed, emulsified images and mount them individually onto small glass plates, strong enough to withstand a projector’s heat. Images which had successfully been screened, therefore, would be mounted on glass. The surviving sequences show several frames that overlap slightly at the edges. The chemicals in the original negatives would have melded together where they overlapped, making them difficult for Le Prince to put onto separate glass plates for projection. 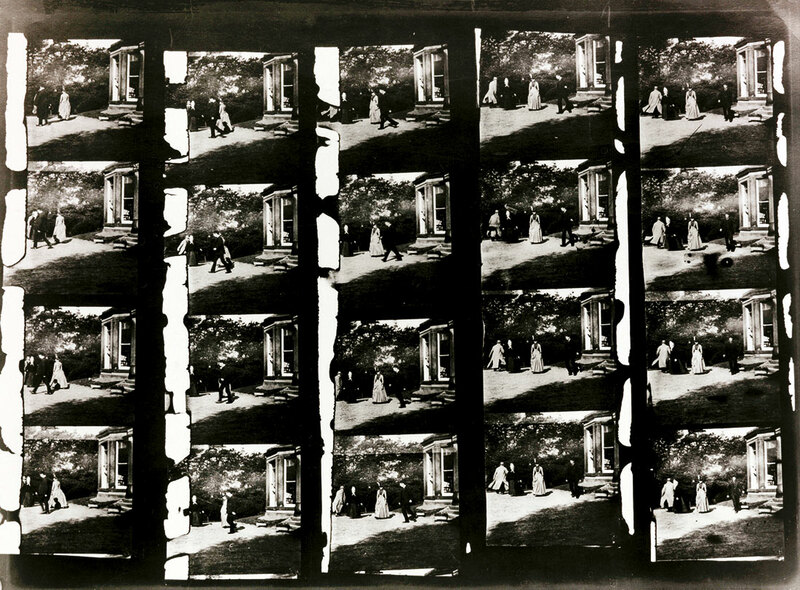 Additionally, black borders all around the images and white frame numbers at the edges of the strips suggest that what survives today are inverted copies of the exposed paper negatives in their entirety – borders, annotations and all – rather than individual glass plates that could have been used in a projector. Why has this not been noticed before? Perhaps because Le Prince’s sequences are no longer viewed as films but as mere symbols that represent an idea of ‘firstness’. Perhaps we have simply stopped looking at his work, which is a shame because his work is beautiful and unusual. Other film pioneers had rudimentary set-ups – uninspired street scenes, for example, or a figure sneezing or waving – ill-posed and uninterested in saying anything other than ‘look, the machine works’. Le Prince, on the other hand, always added something extra. In Roundhay Garden, two women in the middle of the picture move around while two men circle them following paths designed almost certainly to keep them in shot at all times. Le Prince was not just capturing these moments, but directing them as well. The figures’ fleeting interactions, their self-consciousness and amusement despite it all, make Roundhay Garden a moment of quiet charm and subtle mischief. In Accordion Scene, Le Prince’s son, Adolphe, plays the eponymous instrument, smiles broadly and executes a graceful side-step, framed by the doorway behind him; and in Leeds Bridge Scene Le Prince shoots from an upper window, ensuring that the bridge cuts a pleasing diagonal line right through the frame. Le Prince’s films were shot with an artist’s eye, but were any of them actually played back? Perhaps not those sequences we now possess, but witness testimony seems clear that some, long-lost films were thrown onto a sheet by a projector with arc lights powered by a Crompton dynamo, which was powered in turn by a Robey Semi-Portable Steam Engine. In a final twist, however, much of this testimony was hidden away in boxes in archives for almost a century. In the late 1920s and early 1930s, Le Prince’s first biographer, E.K. Scott, chose to publish only the most positive statements, setting aside the accounts that also mentioned Le Prince’s frustrations and failures, such as the woodworker William Mason’s assertion that Le Prince’s films were ‘not shown more than two or three times, because … the electric power was too weak’. The reason for Scott’s reticence was almost certainly due to his efforts to secure a pension for Le Prince’s widow, Lizzie, who, after her husband’s disappearance, was struggling financially. Scott presented to the world a story, not of occasional successes punctuated by obstacles and unreliability, but of (implied) total success which, were it not for the inventor’s disappearance, would have led to riches and fame. Ironically, by attempting to help the Le Prince family in the short-term, he undermined his subject’s legacy by ignoring the less effusive but more plausible testimony to hand, and in so doing he laid the groundwork for subsequent theories that Le Prince had been kidnapped by rival inventors (why else would someone on the cusp of unmitigated success disappear?). There is, therefore, an accumulation of ways in which Le Prince’s work has, in a sense, been lost to us – disappearance, misrepresentation and inattention being just three of them. The flickering images that were thrown onto Le Prince’s white sheet may not have been the ones we thought, but pictures spluttered into life nonetheless. Perhaps it is time to look again at the life and work of this remarkable character, whose ingenious machines created such beautiful, neglected images, and who, according to his assistant Fred Mason, ‘[was] most gentle and considerate ... an inventor of an extremely placid disposition which nothing could ruffle’. And who, in September 1890, disappeared without a trace. Irfan Shah is a writer, researcher and filmmaker from Leeds. He co-wrote The First Film (2015), a documentary about the life and work of Louis Le Prince.